Hi Everyone, congratulations to #26 Mel B...........Winner of last months Challenge with Mandi," It's all About Men". I know you are going to have fun with your fabulous Spica Pen's Prize. The month of October is "Halloween" for most of our International Friends, even though for many of us in Australia, we do not celebrate this occasion in a big way. 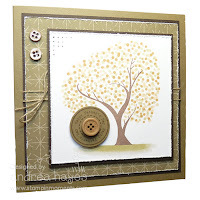 International World Card Making DAY is held on the First Saturday of October and began in 2006 , It is a time to Celebrate the Worldwide Inspiration of Handmade Cards and the FUN of sharing our creations over the Internet. So... with that thought in mind I thought we could all bring out that little 'Spooky"
part we have in us all and help celebrate HALLOWEEN with our friends all over the world. Is there a Prize? : OH....YES, there sure is!!!!!! X-press Graph-X are donating a wonderful prize for this Month. Keep track of your marker colours with this handy swatch book! The color swatch book arranges all 334 Copic colours by family and lists the marker styles for each color, making it easy to choose the next colors you need. This 178x90mm booklet is a convenient size to accompany you wherever you go. let your Spooky imagination run wild!!!!!!!!!!!!! How do you enter? : Use the Mr Blue Frog inlinkz below to enter prior to 4pm Monday 25th October, Australian Time. Winner will be announced on the COPICOZ blog on TUESDAY 26th October 2010. The DIGI Images on my card have been Coloured with Copic Markers after being Printed out with my Ink Jet Printer on X-Press Blending Paper. "There is nothing on this Earth more prized than True Friendship". st Thomas Aquinas. Hello Everyone and welcome back to another tutorial! Today I'm going to talk about Tip-to-Tip and Palette blending. 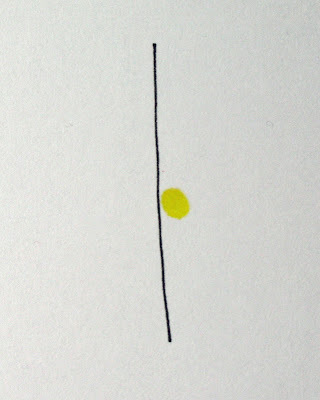 This is a very useful technique to use if working in small areas where you don't have the room to do the usual blending on paper or feathering techniques. When beginners first see tip-to-tip blending, they are a bit shocked that you can touch your dark and light markers together (or even a colour marker to your blender) - but it's fine, you won't damage your marker!! 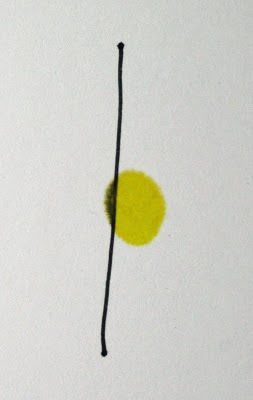 The idea is to use your lightest colour or blender marker as your 'brush' for the darker colour, so that when the darker colour is applied to your project it will fade to the lighter colour (or in the case of your blender - fades to white). Today I've chosen a flower image from JustRite Stampers' Plant a Little Love set with colours Y21 and R59. 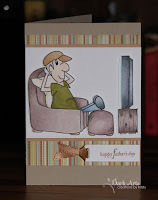 The paper is X-press It Blending Card and the image has been stamped in Memento Tuxedo Black. Because Y21 is the lighter colour, I 'painted' the darker R59 onto Y21. This will in no way contaminate your markers or dirty your nibs - just remember to brush off the other colour off your marker and it will be perfectly clean! 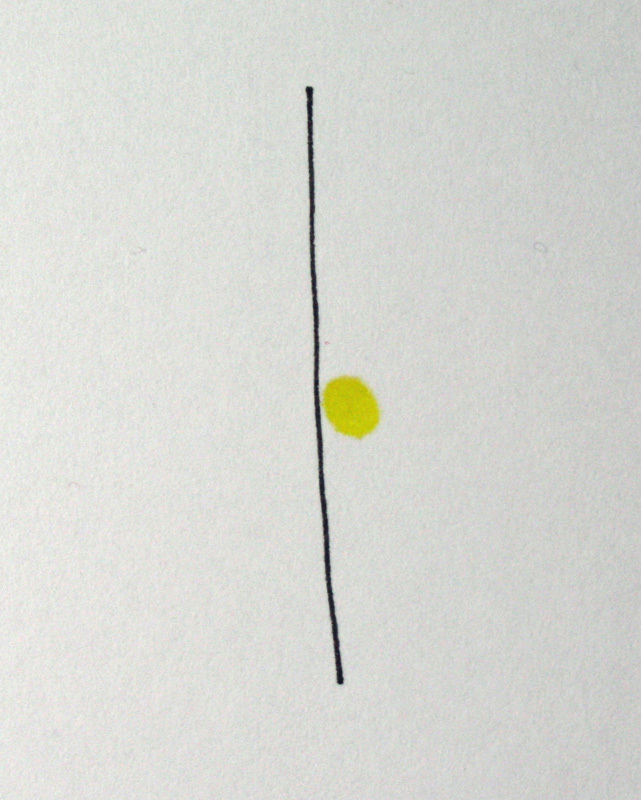 The Palette Blending technique goes hand in hand with the Tip-to-Tip technique, however, instead of applying one marker directly to the other, you add the darker colour to a piece of acetate and use that as your palette. I find this really useful because you can see how much colour you are picking up and have a bit more control. Once you've got your second colour on your lighter colour, you can colour your image and it will fade from one to the other without the need of the traditional blending technique! 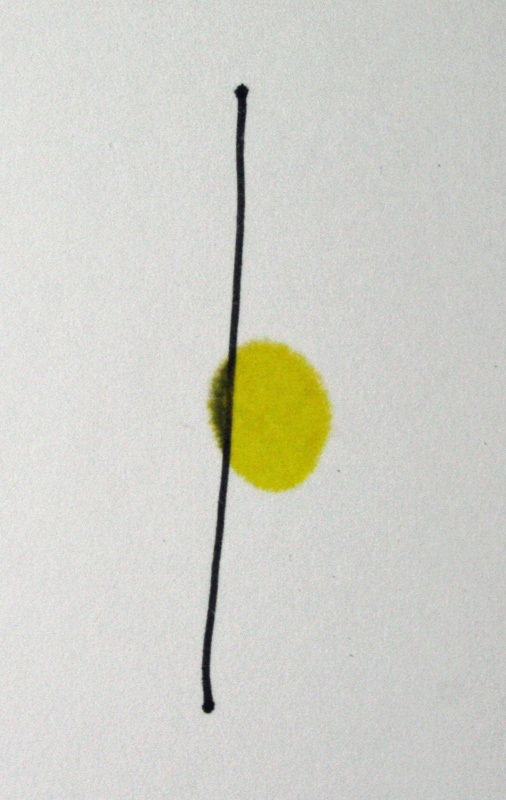 Another great way to use this technique is if you have a lighter and darker colour of the same shade (for example two greens) - by using this technique you'll be able to create a mid-tone shade to fill in that gap for your project!! Here's my finished project with my R59 and Y21 flowers, R59 centres, a touch of C1 to fill between the flowers and G21, G24 and G28 for my stem and leaves. Don't forget you only have a few days left to join in the Masculine Challenge this month and have the chance to win a pack of 12 Spica Pens!!! 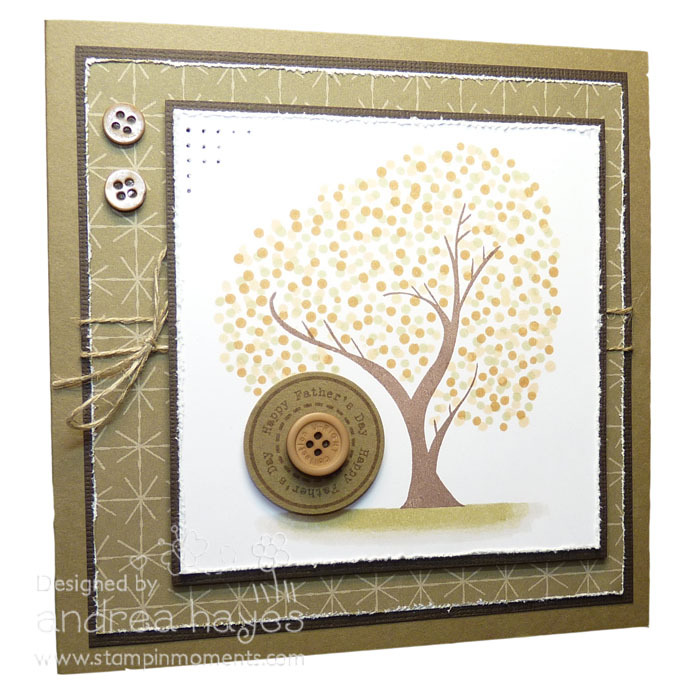 Hope you've enjoyed today's tutorial and will pop back next week for the next fabulous challenge being hosted by Debra!! Today I would like to share with you a tutorial in creating a Footpath or Sidewalk depending on what part of the world you come from.Sometimes when we have an image we need to have some grounding for the image to stand on so I would love to share with you how I do this. What you will need is a Copic Multiliner. I used a 0.3 but any Copic Multiliner is fine, plus Copic Markers C5 , C3 , C1 and a Very Juicy Blender Marker-0 and a Ruler. 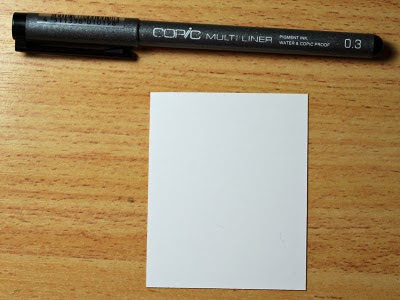 With your Copic Multiliner and a ruler draw 2 Horizontal lines across the paper that you have cut to the size you require- I always use X-Press-It Blending Paper. Now, draw lines vertically down from this line, I always rule my lines on a slight angle rather then straight down. 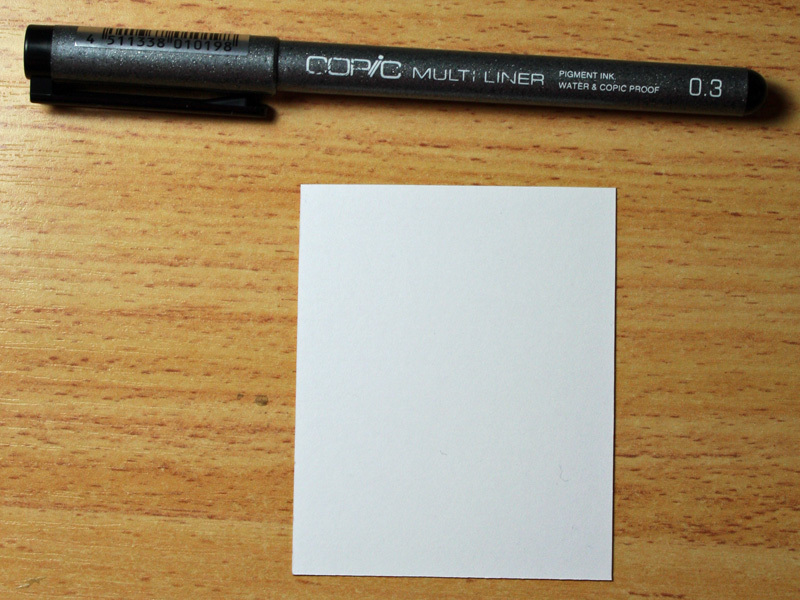 Using your Copic blender marker-0 colour in the whole area you have drawn.I use the chisel end of my marker for this. Pre-soaking the area allows for a better blending in such a large area and also uses less of your coloured marker ink. Following the lines you have drawn and using your C1 feather flick in from the vertical lines towards the centre, You will not need to go all the way to the other side because we want to leave as much white area as possible.. Taking your C3 come in from the line and over the C1, flick colour in again remembering not to extend colour as far as the C1. Now with your C5 and a very light touch just add a small amount of colour to the corners and down your vertical line, I do this by wiggling my pen down the line. I then very lightly blend the C3 with my C1, although this is not always necessary. To finish off I then go over the "whole" path area again that I have coloured using the Chisel end of my Blender . This is gives me the look of washed out cement/pavers that I am going for. 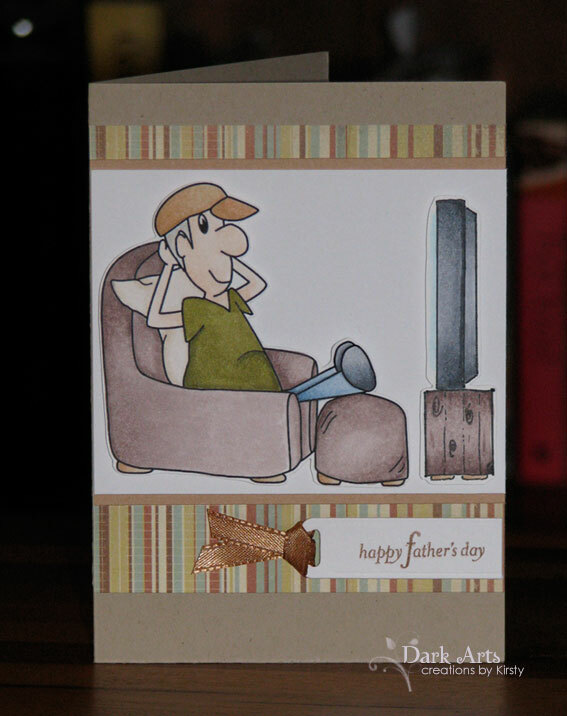 Now I have a path for image to stand on and my card is completed. Try experimenting with different Copic Marker greys, you will be amazed at the look you can create. Hello Everyone!!! Those of you who have been Copic lovers for a while may be familiar with the pitfalls of ink - those who are newer, may not realise how much ink can effect your colouring creations! Because there are so many ink formulations there is no hard and fast rule about dye or pigment ink being better and each brand is different! Today I'm going to show you how to test your inks so that you can avoid the frustrations of colouring an image which then bleeds into a mess! First I took a piece of X-press It Blending Card and a Copic 0.3 Multiliner. Then I drew a single line using the Multiliner. Using a Y06 Copic Marker I placed the nib close but NOT ON the line. Next I over saturated the paper (make sure you have clean paper underneath to protect your table!) so that the ink would move past the line - as you can see, the yellow went past the line and there was no smudging of ink. This shows what a good ink does and you know that this ink will be fine for you to use with your Copic Markers! UGH!!!! What a MESS!!! As you can see, I used the same paper, the same Copic Marker and only used a different ink. 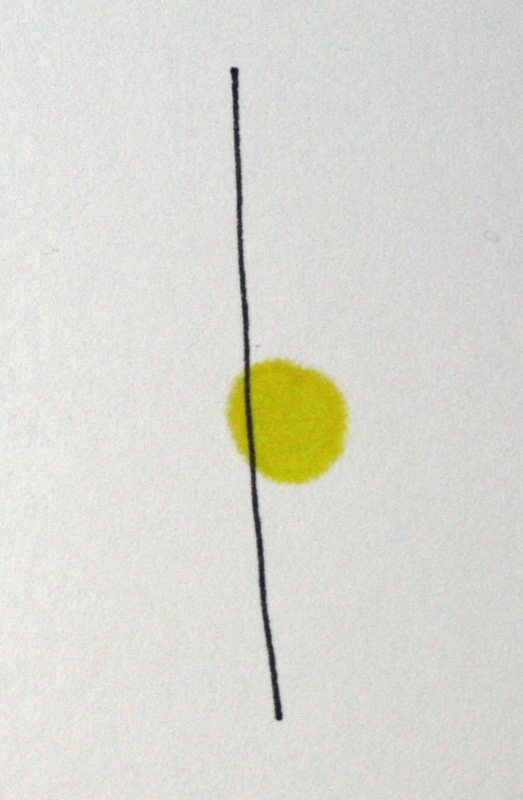 When the Y06 Copic over saturated the paper this time and went past the line, it dragged all that black ink with it!! YUK!!!! Can you image the mess this would make of your image!! We recommend Memento Ink - it's fast drying and will not smudge or bleed. When it comes to digital stamps, we recommend you use a Laser printer or photocopier (not inkjet - follow the rules for testing ink when it comes to inkjets) for your work as the ink is heat bonded to the paper. Of course if you are talented and can draw your own, then a Copic Multiliner is the way to go!! There are some definite No-No's though - don't use your markers with any kind of solvent ink - especially Stazon! Stazon is not a friend to Copics and will ruin your nib!! Other products that will ruin your nibs are - Acrylic Paint, Unfired Clay, Liquid Paper (White Out), Opaque White, Chalks/Pastels or any type of solvent ink. 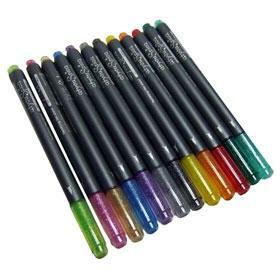 Things that won't ruin your nib, but will discolour it are, lead and coloured pencils and watercolour paints. If you are planning on using two types of colouring medium - always do your copic work first!!! I hope you've found today's tutorial interesting and will pop back next week for Mandi's awesome tutorial and don't forget this month's CopicOz Challenge to make a project for that special guy in your life and have the opportunity to win some fabulous Spica Pens!! !